... genomic BRIDGEs: the development of the BRIDGE protocol for markerless BioBrick insertion . ... bacterial BRIDGEs: the establishment of the FORTH framework for light-based communication. ... modelling BRIDGEs: the modelling aspects of the above BRIDGE and FORTH components . ... human BRIDGEs: examining the permeation of human practices within synthetic biology. ... the applications for and usage of the BRIDGE markerless insertion protocol. ... the applications for and usage of FORTH light-based communication. ... the continued improvement of our models and the applications of the Kappa BioBrick modelling framework. ... more future applications for light-based communication, as discussed in a human practices context. Although we were unable to accomplish absolutely everything that we aimed for, we made great progress in gaining preliminary results and in establishing the foundation of extremely useful (and promotable!) technologies. This page details what we have achieved so far; individual pages for each section summarise our progress on what we'd like to do next as well as any issues that remain, including listing possible reasons for the problems we currently face and the experiments that we are currently undertaking to overcome these. Of course, we are still continuing experiments and hope to have more data to present at the Jamboree... the results presented here are nought but a snapshot in time! We demonstrated that cell lines containing cat in pSB1A2 grew on both ampicillin (100mg/ml) chloramphenicol (40mg/ml) whereas cell lines containing a pSB1A2 control (Edinbrick) only grew on ampicillin (100mg/ml) (see the characterisation here). This proves that cells successfully transformed with cat during the BRIDGE process should be able to grow in cml40. We demonstrated that cell lines containing sacB are unable to grow in sucrose at a concentration of 10% compared to control cells which grew normally (see the characterisation here). This confirms its usefulness as a negative selection marker in the BRIDGE protocol and provided us with conditions for selection at the end of the second step of the protocol. The majority of ground gained in our time working on the actual protocol for BRIDGE was in the adjustment of experimental procedure and the design of control experiments. We managed to fine-tune the protocol to our resources and particular strains without causing damage to the cells. For example, we confirmed that ddH20 is not necessary for the washing step. Despite having access to ddH20 we used cold sterile water, which is just as effective at removing LB and antibiotic from cell cultures. These tweaks make the procedure slightly more cost and time effective, especially for labs with limited resources. We narrowed down the source of entry of a contaminant that was repeatedly infecting our selection plates by sampling the cells at every stage after exposure to unsterile air, a solution, or an instrument. Through use of negative controls and stringent aseptic technique we managed to eliminate contamination entirely. For example, we sampled the sterile water we had been using and moved our washing step the clean hood, away from unsterile air. These controls enabled us to edit the protocol to advise others on how to avoid contamination and how to find the source of a contaminant should it occur. We developed a simple titre of antibiotic resistance by growing our transformants in increasing concentrations of chloramphenicol along with negative controls. This can be used to determine a) the level of success of the procedure and b) the level of resistance of an antibiotic resistance gene (making good characterisation data for the Registry). Unfortunately we never achieved our goal of replacing tnaA with the cat/sacB construct via recombineering, but our lab will continue to work with this protocol, possibly replacing the cat gene with a kanamycin resistance gene. For anyone wishing to use the BRIDGE protocol we recommend focusing on the recombinase induction step, as this seems to be the problem area which results in the lack of recombinants. 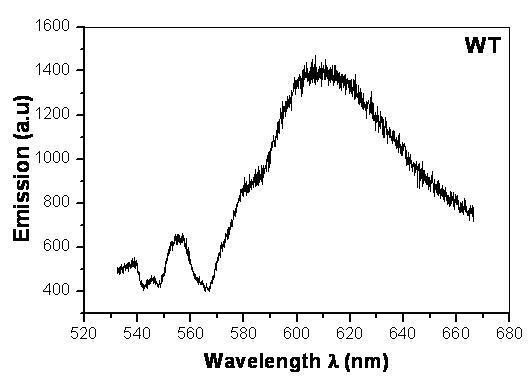 The mutated firefly luciferases S284T were characterised using a spectrophotometric laser microscope, and shown to have been successfully differentiated from the wild-type, as seen in the emission spectrum . We also considered the effect of temperature and pH on the protein, for example finding 30C incubations to produce a much brighter output than 37C incubations. We successfully transformed cells with the BioBricks for the Cph8 sensor system and attempted to characterise them using both lacZ and the YFP reporter systems we introduced to the construct. This produced preliminary data which we will continue to work on, enhancing the sensitivity of our characterisation assays and the test systems for the sensor, in an attempt to further characterise the system. Currently we have not successfully characterised the emission spectra of the blue light production system; however, we have successful fusions of the luxAB / lumP construct which show visible differences in their emissions, and are continuing to characterise their spectra. Preliminary characterisation data on the blue light sensor was achieved, and our overall light sensor characterisation protocol was originally designed and tested on the LovTAP construct. The data has allowed us to refine our protocol for the other sensor systems as well as consider alternative ways of improving the protocol for LovTAP in order to continue further characterisation. Characterisation of the emission spectra of our wild-type firefly luciferase showed results that were unexpected, as shown in Figure 2 on the relevant page. However to the eye it appears visibly yellow, despite the characterisation peak that implies it should be red. We believe this is due to the acidity of the citrate buffer used, as the pH causes the protein to denature and emit red light, however a mix of red and green light is believed to be the cause of the visible yellow. We have designed and built the CcaS-PhoR green light sensor system, but have yet to begin characterisation. We intend to conduct preliminary characterisation of the sensor in the near future, hopefully in time for the Jamboree. As can be seen, many of the requisite parts of the FORTH light communication framework have been successfully synthesised, tested, and are in the process of being characterised. We wish to eventually integrate them together and test them as part of a single overall system, and look forward to further work that will allow us to do so in the near future. The main result achieved by the modelling component of our project was the theoretical conclusion that, given the information available and the assumptions made, the biological systems proposed throughout our project should work. The genomic BRIDGEs model provided verification of the time course of the BRIDGE protocol. The intracellular bacterial BRIDGEs model acted to verify the idea of a light-based repressilating system, and to confirm that the responses of the various light pathways were as expected. Finally, the intercellular bacterial BRIDGEs model established the concept of light-based communication within colonies of cells, in all its complexity. Each of the above models was extensively analysed via a variety of methods available, in an attempt to push the boundaries of understanding regarding the biological processes embodied within. Some interesting results were revealed, but overall this extensive analysis did much to reinforce the conclusion made above - that theoretically, our proposed light communication systems should work! Throughout the process, Ty Thomson's framework for modelling BioBricks in Kappa was found to be an invaluable aid in organising and thoroughly describing the biological parts involved. Whether in simply ensuring that the entirety of the BioBrick's actions were described, or in making explicit the correlation between various rate parameters and their effects upon the model, the usefulness of such a structured and standardised framework in developing biological models cannot be understated. We hope in the near future to be able to extend this into the basis of a 'Virtual Registry' of modelled and characterised BioBrick parts and devices, with corresponding tools to aid design and simulation..
One final result that hopefully was achieved by our modelling is the establishment and promotion of the Kappa stochastic rule-based modelling language as a BioBrick-friendly alternative to traditional methods of modelling such as differential equations. From its introduction to iGEM by last year's Edinburgh team, this year its use has spread to a handful of other teams as well... we are hopeful that this trend will continue in the near future, due to the numerous advantages that are inherent in the approach. One has to be careful how science is explained to other scientists as well as to non-scientists. Metaphor can be useful but also problematic. Use wisely. Awareness and general communication about these issues is key. This makes it clearer what is seen as the important aspects regarding iGEM. As with many things about synthetic biology, discussions have to be had, but there are always multiple voices clamouring to be heard. A personal and interdisciplinary venture in how we identify ourselves as individuals, as part of a team, and as part of a discipline. An outlet and a much needed distraction for several of our team as well as a great exercise in the communication of synthetic biology to a broader audience. An exploration of future scenarios and their implications. We all have contemplated the effects of science in this workshop. And finally, a designer's view of human practices within iGEM, personal and objective... a report expanding on what we have undertaken regarding human practices during the summer of iGEM 2010. When we sat down to draft this conclusion, our immediate reaction was... where to begin? As stated above, the information contained on this wiki is merely a snapshot in time. It is nowhere near the end for the techniques and technologies we have sought to develop. It's perhaps true that our project isn't quite as flashy as some others, or that it hasn't developed anything quite so immediately useful. But, as befitting of an iGEM project in the Foundational Advances track, we believe that we have made great strides towards the future of synthetic biology. Without reiterating what has already been said above, BRIDGE, FORTH, and the Kappa BioBrick modelling framework are all important fundamental developments in the field that we hope will inspire and aid many researchers to come. Synthetic biology is an ever-evolving field, aspiring to greatness both now and in the future. How advantageous would it be to be able to perform efficient markerless insertion across the whole genome? How cool would it be to replace all street lighting with bioluminescent trees? How useful would it be to have biosensors that communicate with one another or with a computer via light production and sensing? How efficient would it be to be able to accurately design and understand whole systems via a standardised modelling framework? These are but a few of the possibilities we see stemming from our work over the summer. We have achieved much. We have learnt more. And we have had a whole load of fun. And we think about synthetic biology differently now. The question is... how do you think?